NEW DELHI: Pakistan on Sunday agreed to a flag meeting in Poonch at 1pm on Monday after the brutal killing of two Indian soldiers. India will reportedly strongly protest against jawan's beheading at flag meeting and demand the severed head, according to TV reports. Indian and Pakistan troops on late Saturday night traded heavy gunfire along the Line of Control in Poonch sector after the movement of a group of suspected infiltrators was detected, in fresh escalation of tension. 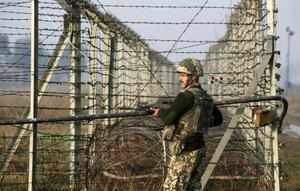 "There was a movement of 6 to 7 persons close to LoC opposite Krishagati sub-sector in Poonch sector at around 2145 hours tonight", Defence spokesman Col R K Palta told PTI. Army sources said since last year, there have been more than 120 ceasefire violations by Pakistan along Jammu and Kashmir which include 97 along the LoC and the remaining along the International Border.